During the build semester, plans become reality. Collaborative work toward a common goal mirrors a professional world dynamic, and is in contrast to much of a student’s academic efforts up to this point in the curriculum. Countless hours of designing and prototyping are traded for 16 weeks of physical labor to transform an empty lot from the ground up. Students are immersed in URBANbuild curriculum full time during the spring build semester with Design Studio, Advanced Construction Technology and Professional Concerns courses. Every January, URBANbuild students arrive on site for their first day of class to find an empty lot with a shipping container full of tools stationed adjacent to the property. Then, they start digging—literally. 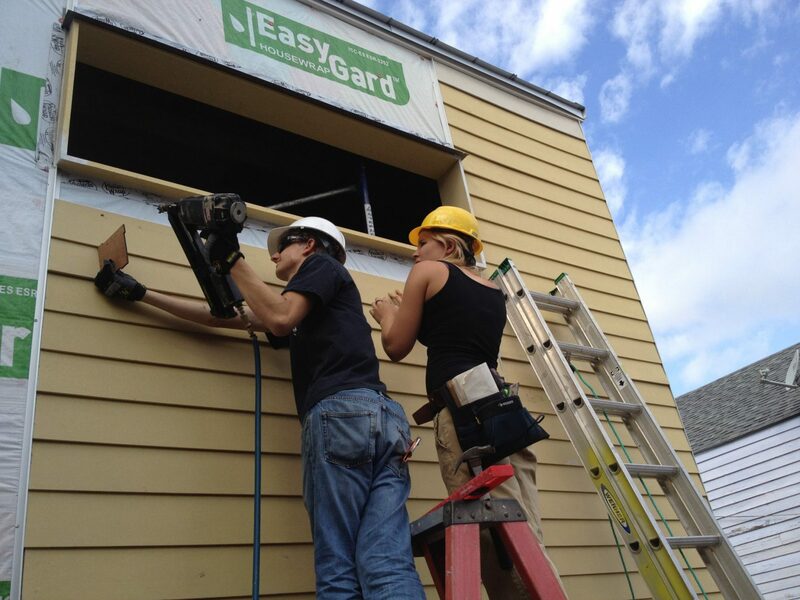 Students learn to frame a house by measuring, cutting, placing, and fastening each framing member themselves. Getting a building under cover from precipitation is a relief and a milestone for any construction project. The URBANbuild team works through the foundation and framing phases efficiently with a goal of getting the house under cover as early in the semester as possible. URBANbuild houses are typically clad in concrete board. Once they have enclosed the structure, students learn to side a house from start to finish, bottom to top. During the cladding process, each day, students assemble scaffolding from which to work on a particular section of the house. Wearing appropriate dust masks, some students stay on the ground to measure and cut concrete board to pass up to their peers who don safety harnesses to climb scaffolding and nail the siding, piece by piece. Working together and remotely from each other at once, both groups learn the importance of clear communication, precise measuring, patience, and forgiveness. Certain systems do require installation by licensed professionals. Students do not run electrical wire, plumbing, or HVAC ducts, but they do gain experiential knowledge of these systems by working on the house alongside the licensed professionals who do. Students have often spent time in the fall semester designing and testing prototypes for special details such as rolling shutters, porch railings, storage cabinets, or lighting fixtures. During the latter half of the spring term, after the house has been framed and protected from the elements, some students may work offsite on these signature design elements. The year 2015 marked the tenth anniversary of Hurricane Katrina with New Orleans in the national spotlight for its heroic redevelopment. The Big Easy, following a long battle against nature and the government, emerged triumphant once again as its regional economy and population increased steadily. Yet, many critics denounced the outcome of the rebuilding effort. They claimed it brought new and more affluent transplants into the city while pushing the native New Orleanians and their unique culture out of the city. Meanwhile, fourteen classmates and I commenced design work on the tenth URBANbuild project. 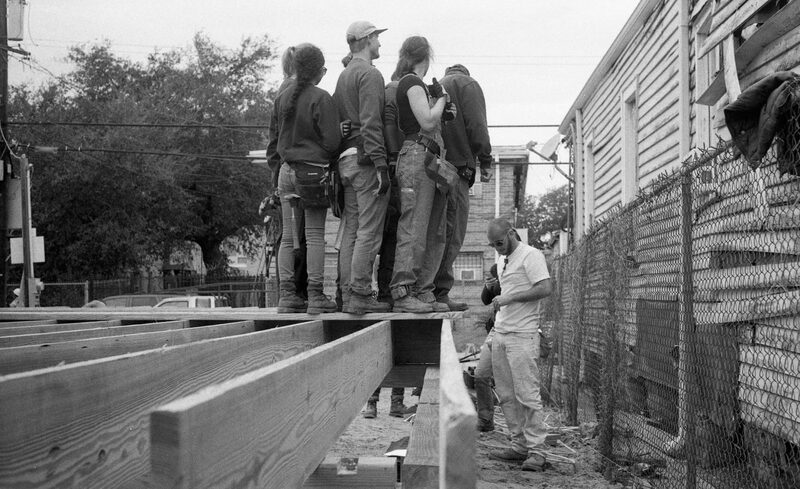 The objective of our initial conversation was to identify URBANbuild’s position within the evolving dialogue surrounding the redevelopment of New Orleans: how has the program, since it’s inception, addressed gentrification and progress at the same time? How will this project build upon the network of URBANbuild homes in Central City and continue to address the fundamental need for high quality, affordable housing? For the months that followed, we critically reflected on how our experiences in the city had been shaped by the urban environment. We drew inspiration from the communal nature of New Orleans: an inevitable by-product of the street grid projecting inward from the Mississippi River and converging to form densely populated wedges of homes. Music can often be heard blaring out of nearby windows while neighbors holler at each other from their stoops. The daily intimate exchanges that result from the city’s unique density create the close alignment of family and community in New Orleans. Our priority was to realize an architectural manifestation of our collective observations, one that is projected to the very fabric of New Orleans and the lives of its inhabitants. Compared to framing, the finishing stage of construction can feel like slow progress; however, perfecting a detail or bringing a phase or room to full completion can be supremely satisfying work. Toward the end of the spring build term, students execute landscape design to the extent that the compressed, 14-week construction calendar will allow. One hallmark of URBANbuild landscape design is the raised planter bed, which is often employed to mediate the transition between ground level and the legally required first floor height, several feet above grade.